Eric Arnum is the editor of Warranty Week, an online newsletter for warranty management professionals. Since 2003, Eric Arnum has been publishing reports on product warranties, extended warranties, and claims rates in various industries. Warranty Week has gained a broad following among manufacturers, retailers, servicers, and insurance professionals. Last year, a commercial service contract trade association was launched at the Nashville conference. This year, two half-day programs have been added to the main conference to delve into topics related to how commercial service contracts are priced, configured, and sold to businesses. As the ninth annual edition of the Extended Warranty & Service Contract Innovations conference prepares to convene in Nashville next week, industry professionals are in for a treat. Following a day-and-a-half of regular programming about the consumer end of the industry, show producers have for the first time scheduled a day-long add-on forum about the business-to-business service contract marketplace. 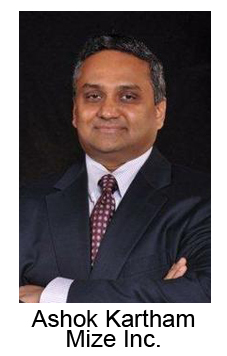 To close out the proceedings on Wednesday, Ashok Kartham, the CEO of Mize Inc., will be speaking with Rob Christian, the president of OnPoint Warranty Solutions LLC, about how to streamline the quote-to-renewal process. Kartham said close to two-thirds of the Mize customer base are on the business-to-business side of the service contract industry, such as Trimble Navigation, Takeuchi Manufacturing, and Blue Bird Corp., makers of the ubiquitous yellow school buses. OnPoint, meanwhile, is using the Mize platform to administer warranty and service contracts on both the B2B and consumer sides. “So we see this as a very important segment for us,” he said. Industry leaders have launched a new trade association for commercial service contracts, with the inaugural meeting scheduled for tomorrow morning. But unlike with product warranties, extended warranties, and protection plans aimed at the buyers of consumer goods, the boundaries of the commercial service contract industry are not as sharply defined. There are signs that the market is topping out at current levels, although home warranty sales continue to soar. Other types of protection plans, such as vehicle service contracts, mobile phone insurance, and extended warranties for brown and white goods, are no longer growing like they used to, though jewelry and furniture protection programs showed slight growth. Apple iOS 11 release this week on the 10th anniversary of the iPhone is a major leap forward and includes many features to enhance user experience further. These five capabilities will have the most impact on how businesses deliver field service and support the customers. Unlike most other solutions, which are designed to integrate with passenger car dealer management systems or retail point of sale software, the new Mize offering is aimed at manufacturers engaged in the business-to-business sale of commercial service contracts. This week, Mize Inc. released the latest version of its Service Contracts Management solution at the Extended Warranty & Service Contract Innovations Conference in Nashville.